how can I remove the facebook skin??? please help me.. I can't read clearly my chats. Same question. Wanted to test out the skin, but it's too much, so - umm a revert or delete button would help. Or, you could just disable it until the appropriate update is uploaded. 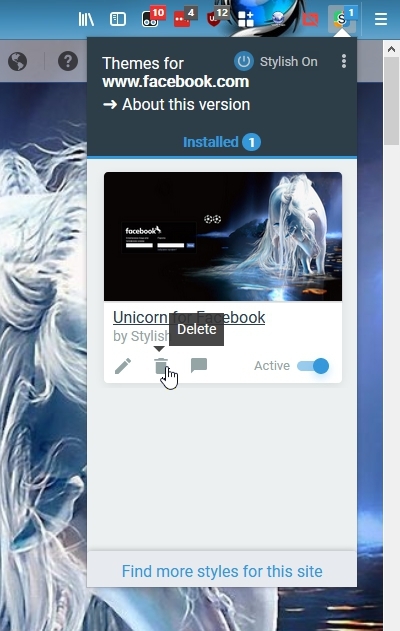 Hey Animatorium, any idea how to find the trash / revert or delete on Unicorn for FB? I've searched and haven't yet. Would love to revert to NO Unicorn- appreciate any help..
Oh, there's no trash folder for Stylish, only backup files(If you choose that option - before deleting). 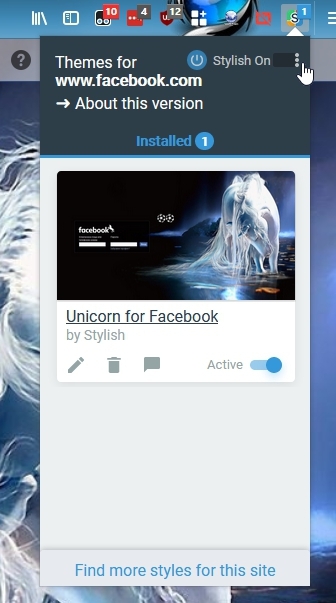 You can just reinstall the style you deleted in a matter of seconds by revisiting the page or choose a different fb style. Styles can be deleted from Stylish in two ways. 1. Through the Stylish icon pop-up. Click the trash can icon under the style shown in the dropdown. 2. Via the manager. Access through the icon pop-up and bookmark it.